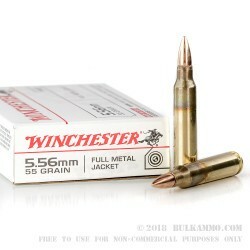 Winchester White Box ammo for the 5.56x45 is a very good product for your mil-spec rifles and anything else chambered in the round. It’s clean, consistent and offers a very solid set of ballistics for everything from hunting to target shooting and regular range duties. The 55 grain bullet is good for any rifling twist generally speaking, but thrives in the 1 in 9 and 1 in 10 formats. A muzzle velocity of 3270 feet per second and a 1305 ft. lbs. of energy number makes it potent ballistically, but not over powering relative to other 5.56 loads. Small and medium game (and even smaller large game) can be reliably taken with the 5.56x45, but you need to make sure of your state’s regulations for FMJ ammunition of this caliber to determine if it has sufficient stopping power for reliable kills in your jurisdiction. 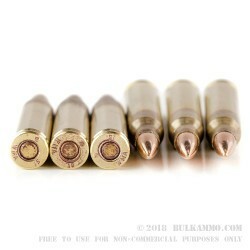 The trajectory of this ammunition is also perfect for a bunch of other tasks out to several hundred yards, so the versatility of the round is exceptional. Winchester has a great history with this White Box line, offering clean reliable ammunition for a low price. 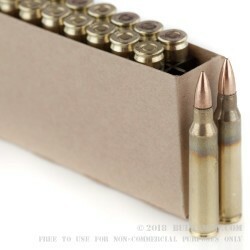 The 5.56x45 is no different, it is a bulk ammunition with quality components without the fanfare or extra marketing costs of some of the others. You’ll find it a very nice plain vanilla round for your AR/Clone and know that you are getting good solid performance out of every box for a decent price point. Received my order very quickly and the follow up from bulkammo is fantastic.. They notified me of order confirmation , delivery confirmation and also checked when the product was delivered. Very professional operation, buy from bulkammo without any worry. Q: What is the muzzle velocity of this round? A: Hello! 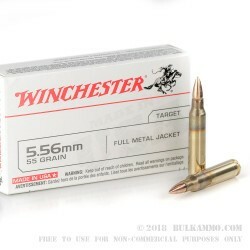 Winchester lists the muzzle velocity of this 55 grain round at 3,240 fps.